(L-R) Nicki Minaj, Lewis Hamilton, Tommy Hilfiger and Dee Hilfiger attend the TommyXLewis Launch Party at Public Arts on September 10, 2018 in New York City. One of the most star-studded events of September’s New York Fashion Week didn’t feature a runway show. 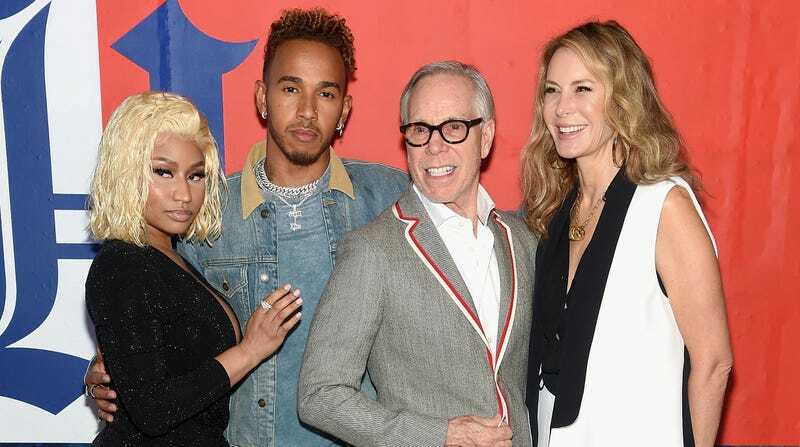 It didn’t need to, since most of the celebrity guests at the U.S. launch of TommyXLewis, Tommy Hilfiger’s collaboration with English racecar driver Lewis Hamilton, arrived wearing pieces of the new collection. Hamilton, who has been teasing the line for months now, mysteriously arrived with none other than Nicki Minaj, who has been a mainstay throughout the week’s festivities, despite her much-publicized dustup with nemesis Cardi B on Friday night. We won’t speculate on that slightly odd pairing, but aside from Minaj, supermodels, celebs and celebrity offspring (we see you, Christian Combs, Lori Harvey and Myles O’Neal) turned out in force to support the collaboration between one of America’s most enduring sportswear brands and one of Britain’s most fashion-forward sportsmen. Nicki Minaj and Lewis Hamilon attend the TommyXLewis Launch Party at Public Arts on September 10, 2018 in New York City. As for the New York launch, it appeared to be another hit for Hilfiger, but like every label launching a collection during the week, only sales will tell if celebrity endorsements really pay off.